We have 3 jet black cats - but their colour is the only thing that have in common as they have such different personalities. Jinny is the youngest and liveliest. The hunter that will bring back dead birds and mice, inquisitive and quick. She has a squeeky meow and can be found investigating bags and boxes for food! Bernard is probably the oldest, but we don't know his age, background or even original name as he was abandoned by his previous owners. 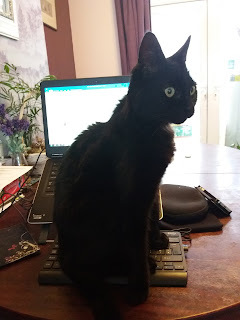 He has only been with us for 6 months but had changed from the thin, scraggy cat who had a constant meow for food, now that we have got the right dose for his thyroid medicine. He has already sussed out the soft touch neighbours and spends a lot of time in other peoples doorstep, gardens and houses - should be renamed six dinner Sid! And lastly comes Millie - also known as Fatty Puss. She should be a small petite cat with dainty paws and face, but is just a roly-poly ball on legs. She rarely leaves the house and if turfed out to the garden, sits in the sunniest spot that is near to the house as possible. She loves her food and will hoover up any left-overs from the other two. She has problems with her teeth, but still manages to eat well. She seldom makes a sound, is very shy and I don't think she has ever caught a mouse, but is no trouble at all.